When the density of the hot, ionized gas (known as a plasma) in a tokamak exceeds a certain limit, it usually leads to a rapid loss of heat and plasma currents. The currents are required to confine the plasma. Such events can seriously damage the tokamak. Before the disruption, scientists often observe large magnetic islands. Magnetic islands are thermally isolated, small "bubbles" of plasma. Recent investigations confirmed that scientists could use these islands to correctly predict the density limit. The team showed that when the island becomes large enough, the hot plasma core mixes with the cool plasma and causes the disruption. They can use this information to control the disruptions. The density limit in tokamaks has been an experimental obstacle for decades. It's crucial to understand the density limit. Why? Because in fusion power produced by tokamaks, the higher the plasma density grows the more power is produced. This work correctly explains the density limit. This has led to suggestions that the density limit can be exceeded by carefully heating the magnetic island using external heating sources or by reducing the impurity density. In this work, the classical expression for the growth of a magnetic island's size is extended to include the effect of island asymmetry (shown in the figure) and the effect of thermal perturbations inside the island. These corrections are crucial for understanding the dynamics of magnetic island growth and therefore disruptions. 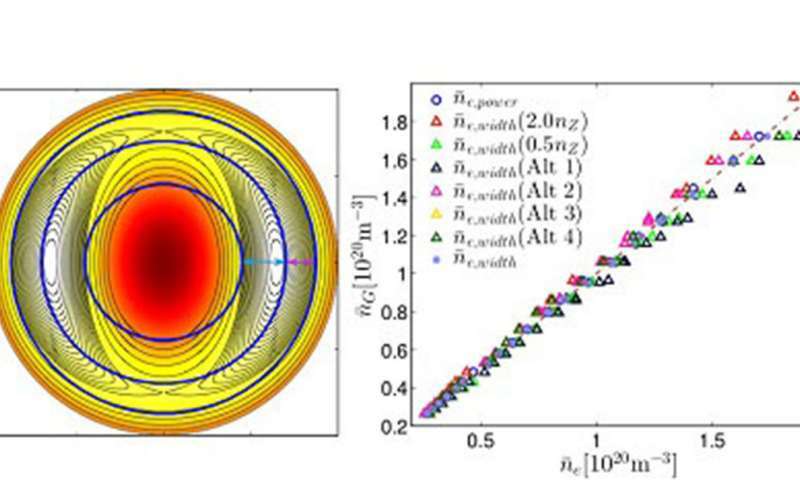 The increased density limit predicted by the new model agrees almost perfectly, as shown in the figure (right), with the scaling laws derived from an experimental database of disruptions for the world's most important tokamaks. When the plasma density is increased, the plasma currents shrink, and so the heating is reduced. The impurity radiation, on the other hand, is proportional to the square of plasma density; so, as the density doubles, the cooling quadruples. The magnetic island will grow when the "cooling" power flowing out of the island exceeds the "heating" power flowing in. The heating comes from the small-but-significant electrical resistance to plasma currents. The cooling comes from radiation emitted by impurities in the magnetic island.